2. If your garage is more than a garage, like many families, and more of a warmer “living space” surface is what you desire, you might want to consider a rapidly growing popular option that we pioneered. By using industrial sealer made to withstand all the rigors of hot tire marks, gasoline, oil, etc. 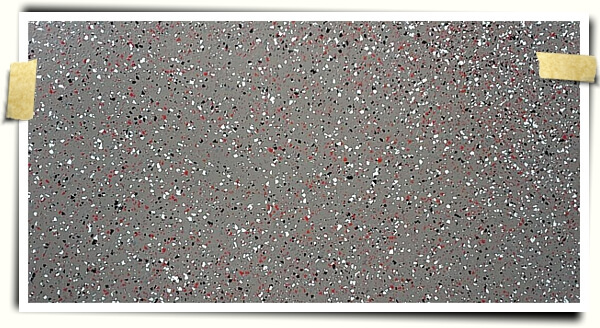 we are able to create a garage floor that is decoratively stained (colored concrete) and visually appealing. This type of floring is much like what you see in restaurants, coffee shops, etc. No two are alike. When it comes to garage floors, colors and textures, the possibilities are endless. With this in mind it is important to remember that we like to get our clients involved in the process. Decorative concrete is an art form on a sometimes unpredictable surface. Each client has different tastes and expectations. Samples are always prepared (of stained concrete) and your ideas and vistions are incorporated until we find a look you desire within the realm of what is possible. Your Concrete Guy maintains a small staff of well trained professionals that consistently receive high marks for friendliness, efficiency and cleanliness. We love to create unique and classic floors.